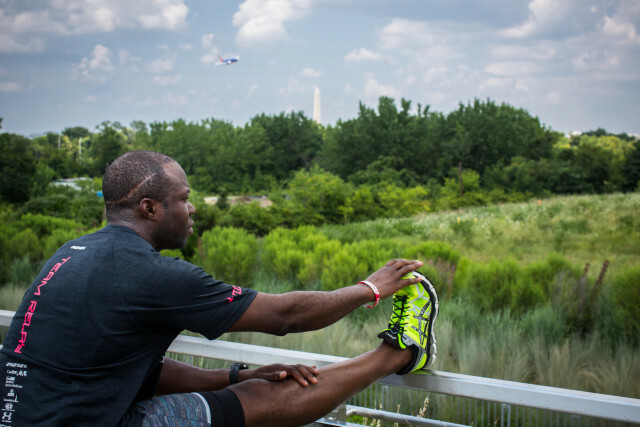 In the months leading up to 2015’s Fall marathons, RunWashington is following several local runners as they prepare for their races. We’ll chart their progress as they train their legs, lungs and minds for the challenges they’ll race on race day. Each week, we’ll catch up with our runners and see how they’re doing. This is the third story about Will Etti, read the first and second. For Will Etti, the marathon is a proving ground. But the physical rigors of marathon training are just a part of it. That part is going well. He has finished two 20 milers (his Garmin gave him 19.97 for one, but he’s rounding up). He is continuing with his stretching and foam rolling routines, and has added “body pump” to his cross training mix, along with spinning. One thing that’s surprised him is his recovery time. His recovery shouldn’t be a complete surprise – he’s foam rolling before long runs and taking ice baths after them. His training hasn’t been without mishaps. While scoping out a good spot for a group photo on a 16 mile run with his training group, Etti fell down a flight of stairs, straining his hip flexor. He kept up his fitness with cross training and running on an anti-gravity treadmill. He bounced back from the injury and was able to hop back in with the team on his long runs. Etti’s life, his other marathon, the one he calls “ the mental marathon” – is pretty much all about bouncing back. His path to distance running started after he learned to walk again when he was seriously injured in a car crash. But his relationship with running goes back a lot further. Etti was raised by his grandmother, who died when he was a teenager, leaving him to chart his own course. He describes where he grew up in Parkview Gardens in Riverdale, Md. as a tough neighborhood, where getting jumped was common. So was seeing people drunk, high or, in an extreme case, dead. He also credits running with giving his life direction and changing it. “I remember sitting around in college and talking with somebody else about the first time we saw somebody get killed,” he said. The rest of the people in the group were shocked to hear that, and Etti realized that that wasn’t an experience everyone had. Running on his high school track team gave Etti the realization that there was more out there. “Sometimes your little neighborhood can seem like the whole world,” he said. Running not only exposed him to different towns and counties, it also gave him structure. It also made him work on his time management skills, so that he could maintain the high GPA he carried on to college. Those time management skills are coming in handy. With two boys at home and both he and his wife working full-time, the Ettis are busy. Will just got a new position at the Food and Drug Administration. And he’s halfway through a doctoral program in organizational leadership, with one class to go before he has to sit for comprehensive exams and begin his dissertation. He’s been juggling classes at the University of Maryland Eastern Shore on top of everything else for the last three years. When asked how that works in his family, he stresses that he sends his wife and his mother-in-law flowers frequently. And that he spends as much time with his boys as he can – running with them on Saturdays, going to the library with them on other days, and, “I get less sleep than is recommended,” he concedes. “We really use our family calendar,” he said. And at the end of each accomplishment, the reward is family time. For Will, running is a part of all of this, “the mental marathon” he calls it. Running helps him center his mind, reflect on his goals, gives him a way to recalibrate and put it all in order. “I do a lot of self-talk on my runs – I’m going to finish this run just like I’m going to pass this statistics exam,” he said. In that way, Will is like most runners. We need the miles for our training plan or to counterbalance our cupcake habit, but we also need it for that place in our brain where ‘can’t’ and ‘crazy’ live, and try to stir up trouble on rest days. Will Etti may let the weather determine his race, by the way. He’s signed up for the Baltimore Marathon Oct. 17. And the Marine Corps Marathon, Oct. 25, which is also his birthday. He hasn’t decided which one to run yet. Whichever one he sets his mind on, he’ll be just fine.